This tie shows a little wear along the narrow part. Looks like it might have been left tied and hung up, just has some wrinkles. 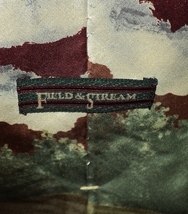 The tag states Field and Stream. 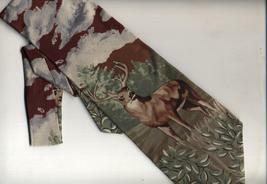 The tie is made in the USA of 100% imported silk. It has not been washed, but has been aired in the Carolina sunshine. It measures approximately 58” long and 4” across at the widest part. Please email with any questions. International buyers please contact me before purchase for postage quote. My items come from various places and I cannot state that they are from a pet or smoke free home.